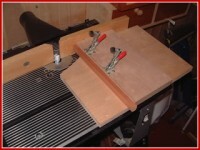 The router table is one of my most favourite tools in the workshop. A lot of people don’t realise what a great job the router table does cutting tenons. 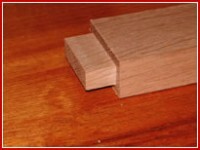 Before I made this jig I used to use the standard mitre gauge to cut tenons then I saw this simple jig featured by Pat Warner in FineWoodworking magazine. As you can see from the photo it can’t be any simpler. All it is, is two small boards of plywood and pair of toggle clamps. It works great! Setting up a ‘stop block’ stops you from going to far and cutting into the jig and using a scrap of wood as a ‘back up’ piece helps prevent any tear out and again stops you from cutting into the jig. I really need to replace the toggle clamps with bigger/stronger clamps as the ones I currently have are a tad to small. 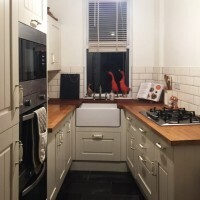 They cope fine with the work piece in the picture (45mm wide) but anything bigger and they don’t hold down as well. It’s a very easy jig to build. Taking your time it will take less then half an hour to make. 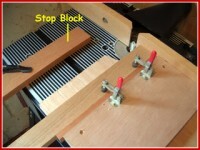 Just make sure the edges that come in contact with the router table fence are straight. To make the jig, cut a piece of plywood or MDF to 280mmX380mm and cut a notch off one of the corners to make clearance for the router cutter. Now take another piece of plywood and cut it to 150mmX280mm, pre-drill and countersink four holes near each corner of the smaller piece. With a bit of glue applied to the underneath of the smaller piece position it on top of the bigger piece of plywood, near the start of the notch you made. Making sure that the two pieces are flush to one another and that the edge of the top piece is 90° to the edge of the bottom piece, screw it down and finally attach two toggle clamps and your done.